Hundred Waters – Cavity from Michael Langan on Vimeo. More than 400 years after its discovery by astronomer Galileo Galilei, the largest moon in the solar system – Jupiter’s moon Ganymede – has finally claimed a spot on the map. A group of scientists led by Geoffrey Collins of Wheaton College has produced the first global geologic map of Ganymede, Jupiter’s seventh moon. The map combines the best images obtained during flybys conducted by NASA’s Voyager 1 and 2 spacecraft (1979) and Galileo orbiter (1995 to 2003) and is now published by the U. S. Geological Survey as a global map. It technically illustrates the varied geologic character of Ganymede’s surface and is the first global, geologic map of this icy, outer-planet moon. The European Space Agency’s Jupiter Icy Moons Explorer mission is slated to be orbiting Ganymede around 2032. NASA is contributing a U.S.-led instrument and hardware for two European-led instruments for the mission. Since its discovery in January 1610, Ganymede has been the focus of repeated observation, first by Earth-based telescopes, and later by the flyby missions and spacecraft orbiting Jupiter. These studies depict a complex, icy world whose surface is characterized by the striking contrast between its two major terrain types: the dark, very old, highly cratered regions, and the lighter, somewhat younger (but still very old) regions marked with an extensive array of grooves and ridges. According to the scientists who have constructed this map, three major geologic periods have been identified for Ganymede that involve the dominance of impact cratering, then tectonic upheaval, followed by a decline in geologic activity. The map, which illustrates surface features, such as furrows, grooves and impact craters, allows scientists to decipher distinct geologic time periods for an object in the outer solar system for the first time. 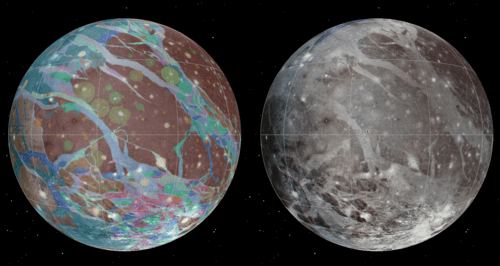 The Ganymede global geologic map will enable researchers to compare the geologic characters of other icy satellite moons, because almost any type of feature that is found on other icy satellites has a similar feature somewhere on Ganymede. Amateur astronomers can observe Ganymede (with binoculars) in the evening sky this month, as Jupiter is in opposition and easily visible. The project was funded by NASA through its Outer Planets Research and Planetary Geology and Geophysics Programs. NASA’s Jet Propulsion Laboratory is managed by the California Institute of Technology, Pasadena. new year, new #undergroundheat !! Stay Strong and Live with Passion.